Honeywell and Motorola Solutions Now Dominate the Landscape; Can Datalogic Make it Three Players Again? Some nine months after the deal was first announced, the Federal Trade Commission has approved the acquisition of Intermec by Honeywell, a deal that reduces the playing field for handheld wireless devices for manufacturing, distribution, and other applications from three primary US players to two. As a condition of the approval, however, Honeywell will have to license the patents needed to make two-dimensional bar code scanners to Italian rival Datalogic for 12 years. The FTC said that licensing the patents will resolve its charges that Honeywell's acquisition of Intermec is anticompetitive. A key question is how Honeywell will handle the product line integration and inevitable consolidation among its Dolphin, LXE and now Intermec products. Deborah Feinstein, director of the FTC's bureau of competition, in a statement. Honeywell, which is based in Morris Township, N.J., announced late last year that it was buying Intermec - one of the pioneers of the auto id industry and which has been bought and sold several times over its history before ending up as a private company again - for about $600 million. Intermec is also the parent company of voice technology leader Vocollect, which will now also go to Honeywell. "We're pleased to have the FTC's approval for Honeywell's acquisition of Intermec and in the near term will be focused on the integration of the businesses," said Bruce Eric Anderson, a spokesman at Honeywell. 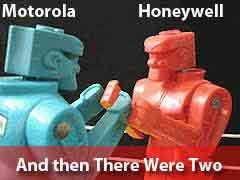 With the approval, Honeywell and Motorola solutions stand as the two giants in the wireless terminal market, after a series of acquisitions in the sector over the last decade has really winnowed down the field. The real consolidation in the wireless terminal industry arguably started all the way back in 1997, when Intermec acquired what was then Norand, a rival of sorts in distribution applications but with a dominant position in applications and terminals for route accounting/direct store delivery requirements. In 2000, another auto ID industry pioneer Symbol Technologies made big news by acquiring fierce rival Telxon, giving it a dominant position in the wireless industry. In the same year, Europe's Psion acquired Teklogix, a Canadian specialist in very rugged devices in distribution generally and which had a strong position for terminals for freezer applications in North America. In 2006, Motorola acquired Symbol Technologies, after Symbol had started to recover from a series of financial scandals that resulted in its CEO fleeing the country and who is still on the lam. Honeywell, a $38 billion company with huge automotive and aerospace businesses, got into the auto ID market in 2007 when it acquired Hand Held Products, bringing it the Dolphin line of data collection terminals. After a bit of a lull, several more major deals have occurred over the last few years. In 2011, Intermec acquired voice technology and device provider Vocollect. A few months later, Honeywell acquired EMS Technologies, primarily for its presence in various areas of aerospace and electronics, but along with that deal came LXE, long a strong provider of wireless systems for distribution and ports. Then in early 2013, Motorola Solutions acquired Psion, which was then followed by the Honeywell acquisition of Intermec that waited for this just announced FTC approval. Got all that? Again, it leaves just Honeywell and Motorola standing in the US. Datalogic has a strong presence in Europe, and in North America for fixed scanners, but it has not been much of a force to date in the handheld terminal market. "I believe you need at least three providers for a healthy market and to provide a decent set of alternatives, and this acquisition of Intermec by Honeywell could open the door for Datalogic to make a bigger presence here," said SCDigest editor Dan Gilmore. "There are also some little known vendors from Asia trying to crack into the market, using price as their strategy, but to date they really haven't had any success. Maybe that changes at some point." In the next few years, Gilmore says, Motorola and Honeywell may start to see more competition from smart phone and tablet devices than from each other. Motorola already makes ruggedized tablets from manufacturing and distribution applications. Does having the market down to just two main wireless terminal providers concern you? Let us know your thoughts at the Feedback section below.